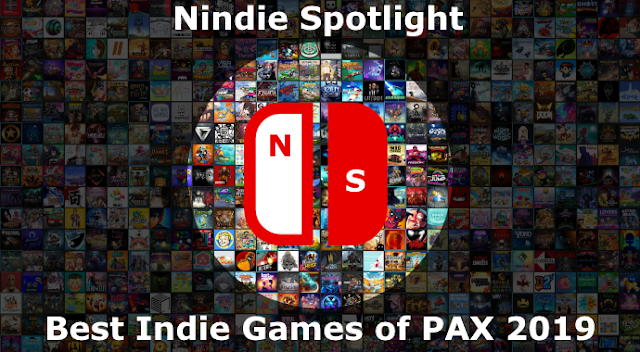 With so many games available everywhere, and even early on with the Switch, it can be hard to differentiate yourself. Some do it with graphics, some with novel gameplay concepts, some with a dash of insanity… and then there are some that manage to do all of the above. 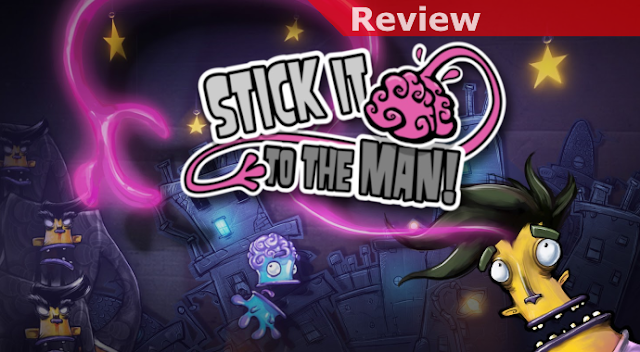 While the core game experience is mostly a platforming adventure Stick it to the Man is perhaps one of the funniest and most unusual games I’ve played to date on the Switch, or just about anywhere. Your main character in this adventure is Ray, a relatively unassuming and ordinary man who gets involved in some extraordinary circumstances. A freak accident causes a container to be dropped from the sky and it embeds what he calls a pink “spaghetti arm” in his head. He quickly finds that it can both be used to manipulate the environment around him and even read people’s minds. Unfortunately it seems that secret agent types are also aware of this accident and are keen to capture him, setting up your 10 Chapter adventure. The gameplay, overall, is actually pretty simple in principle. You’ll enter an area, explore, read the minds of the people and things that are around, look for clues and hidden spaces, and then work to figure out how to progress by essentially satisfying a chain of events. To resolve Situation A you’ll first need to help with Situation B, but to do that you’ll need to get involved with Situation C. What makes the entire experience worth it, though, is how much crazy fun it is to get involved with some of these very unusual characters. The thoughts of most of the people you run into are positively weird and often practically laugh out loud funny. There are strange cultural references, shots fired at video games, and all sorts of random things going on with people. This extends quite a bit into the solutions you’ll end up finding to most problems as well and these also can be quite funny, though at times they can be unorthodox to the point they’re not immediately obvious either. In order to drive the humor and quirky style the game’s production values are absolutely superb. 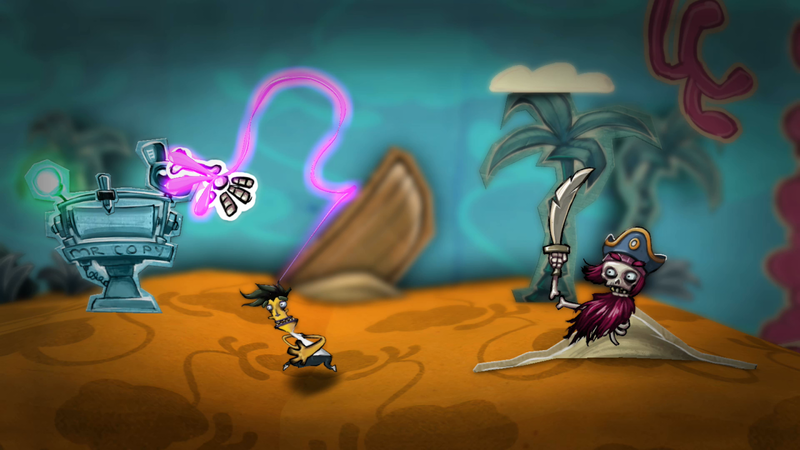 The visual style has a sort of cardboard cut-out appearance and each character is drawn in a somewhat Tim Burton-esque style as well. Layer on some great music and top-notch voice acting and the adventure is very easy to get engrossed in as you work your way through this motley collection of weirdos and often bizarre situations. This all generally works well both play mode though I did find some details like the curled edges of the scenery you need to pull on to reveal hidden areas hard to make out at times without scanning through a second time more thoroughly while in handheld mode. If you’re looking for something very different to just dive into for a great time and some laughs for several hours there’s nothing on the platform that delivers quite like Stick it to the Man. 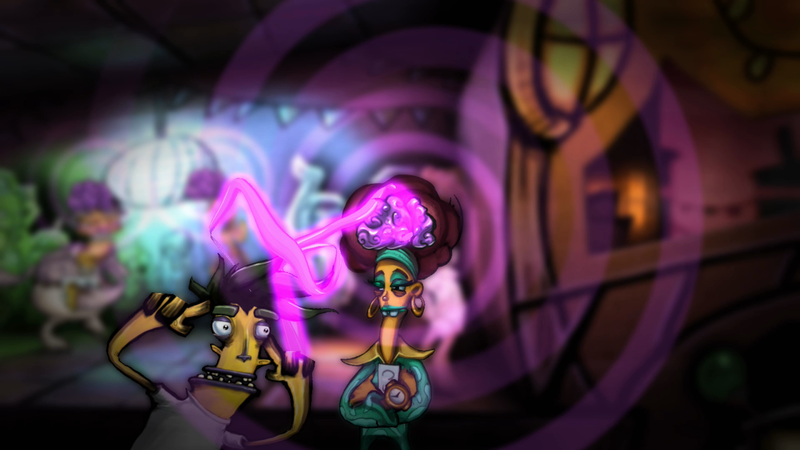 Full of quirky charm, unexpected situations, and truly bizarre characters it’s just a breath of fresh air and not quite like anything I’ve played in quite some time. While the puzzles generally aren’t very complex they do show a great deal of creativity and can have you chuckling along the way, it is definitely a game far more about the experience than the solutions and accomplishes what it set out to do superbly.